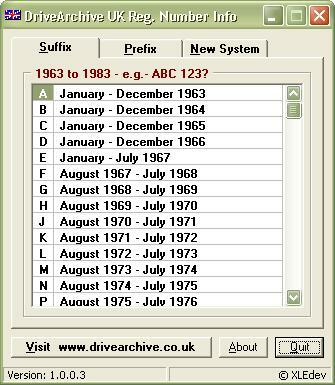 The intention is to have a number of original motoring related Freeware software applications available for downloading from here. Currently there are two motoring related programs, a simple Fuel Consumption Calculator, and UK Registration Number Info - which allows you to work out which year a given UK registration plate belongs to, plus a Scalextric Track Length Calculator which does what it says on the box. or you can either Save or Run the installer from the EXE option. 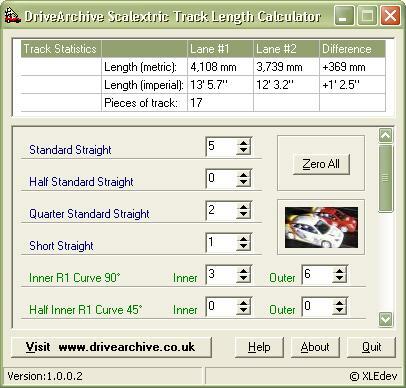 To download the Freeware 'DriveArchive Scalextric Track Length Calculator' click for either the zip or the setup executable. What does it do? Well, if you enter into it the track pieces used in a circuit, it will calculate the length of the inside and outside track, which could well be of interest to you if you're trying to build a fair circuit. You pick one lane and follow it around counting how many inside and outside curves etc are used, and the calculator will tell you the difference in length. 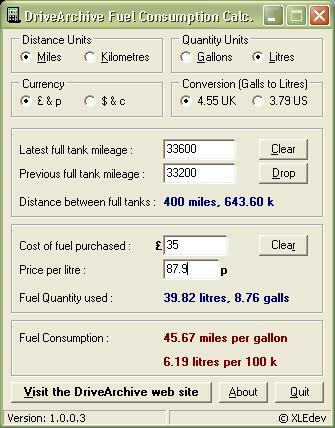 To download the Freeware 'DriveArchive Fuel Consumption Calculator' click for either the zip or the setup executable. What does it do? Well, if you always top up your tank to full, and you note down your mileages, then the calculator will quickly give you your MPG. So... fill up you tank, note mileage, and drive! Next time, fill up your tank, note mileage, cost per gallon and amount paid. The calculator will work out the MPG, Simples! To download the Freeware 'DriveArchive Registration Number Info' click for either the zip or the setup executable. What does it do? Well, to be honest, not a lot! No... hands up, I admit this is not the most revolutionary piece of software ever written. Unless... yes, unless you want to quickly 'translate' the number plate of a car into the year it was registered... which you well might, and there have been several different schemes over the years, so it's no exactly obvious. N.B. these programs are not dangerous to your PC, have just a very simple Setup routine, and contains no viruses, spyware or irritating adverts. There's no good reason you should believe this, but that is the truth, what more can I say?